Mini Gluten-Free Easter Baskets, Plus a Giveaway! I just can’t seem to get this song out of my head…. 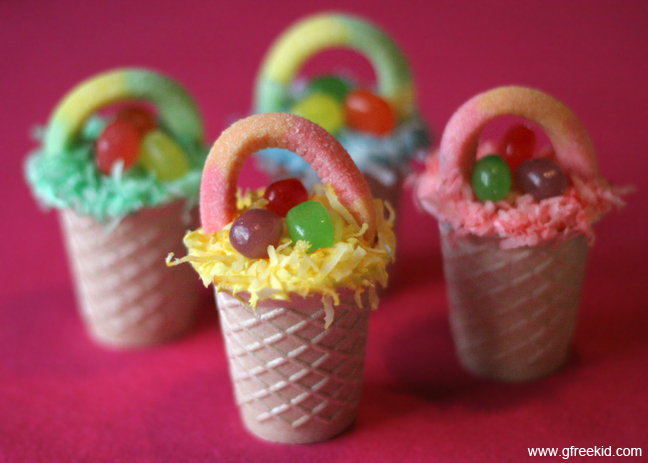 Partly because my girls’ weekly piano lessons are today (and I’m thinking of teaching them a simpler version of this tune) and partly because I am so excited about these cute, little Easter basket treats we created a few days ago! Gluten-free, of course! One “replacement food” my family is thankful for is gluten-free ice cream cones, especially around holidays when it’s fun to create kid-friendly goodies with them. A local gourmet food shop owner started a gluten-free section in his store a few years ago, after he heard that my daughter and I were diagnosed with celiac. One of the products he started stocking (to my family’s delight) was Goldbaum’s gluten-free ice cream cones — both sugar cones and cake cones. 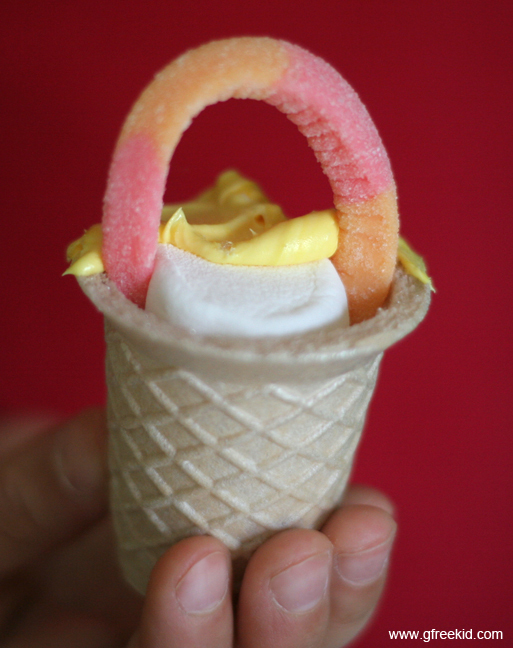 Looking at the cake cone box (they call them “cups”) the other day, it just said “Easter baskets” to me. I could picture them in my mind, yet I had doubts about how I would pull off the handle. Thankfully everything came together just perfectly and it was a big success. 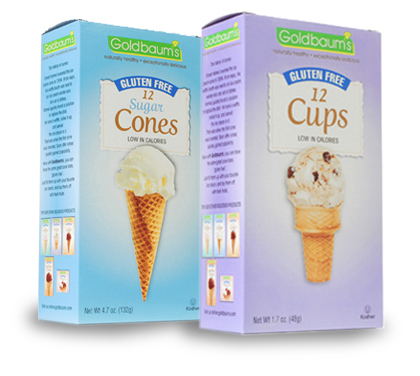 And now for the giveaway: Goldbaum’s has generously agreed to send three, lucky, randomly-drawn winners the following prize: 1 box of sugar cones, 1 box of regular cone cups and a few other Goldbaum’s gluten-free products which will remain a mystery! To enter, please leave a comment below, letting me know how you make Easter special for your g-free kid: Do you re-make favorite recipes gluten-free? What special things do you put in their Easter baskets? How do you make sure they are included in the big family meal? Any other ideas you can share? Giveaway ends at midnight on Thursday, April 5th. Then the 3 winners have 48 hours to get back to me, otherwise new names will be chosen. U.S. Residents please. Good luck! 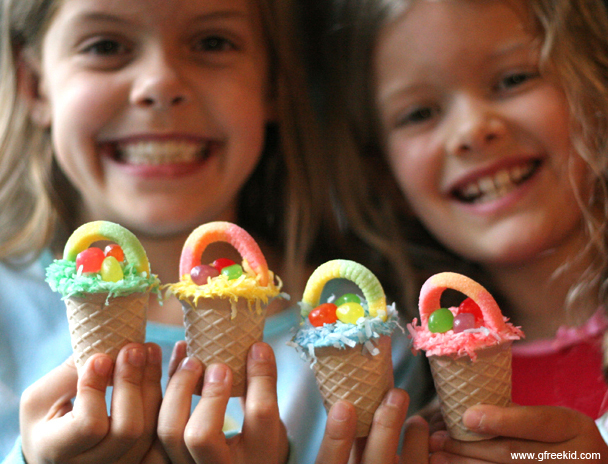 Now get out there and buy yourself some cones so you can make these baskets with your kids in time for Easter! When you try them (you just have to — they are SO easy!) feel free to post a photo on my Facebook page. And in case you missed our Chocolate Peeps Eggshells and Muddy Bunnies, just click this link or see the post below this one. This entry was posted in fun for kids, g-free recipes, giveaways, kids in the kitchen and tagged celiac kid, desserts, Easter baskets, expiriment, fun ideas, giveaway, gluten-free kid, Goldbaum's, holiday, ice cream cones, kids helping, parties, recipes, school parties, treats by kachalmers2. Bookmark the permalink. We try to stay naturally gluten free with our meals, though for Easter we will be making some substitutions for desserts. We always like the strawberry pretzel dessert (sub GF pretzels) and will be doing some lemon cups we will be making GF with some sort of GF cookie crumb. Yum! this is our first Easter with my daughter on a GF diet. i still haven’t purchased/made anything for a “basket” gift yet, eek! she’s always been limited on the candies anyways, due to her peanut allergy. as far as a meal, it will include recipes and items she can enjoy! This is our first Easter being gfcfsf. We will not be eating the typical foods but thankfully he is picky and doesn’t eat what everyone else is eating anyways. Usually we have Easter at home alone, but this year we are going to spend it with our family (cousins, aunts/uncles, grandparents, great-grandmother, etc.). That will be extra special! We will probably do most of the cooking to ensure it is GF and safe for our boy. Along with trying to provide the gluten free treats (I love the little easter baskets you have shown us..!!) we also try to find “different” little items for the baskets! Talking eggs, little games..etc..AND I’m finding that I don’t really need gluten when I’m cooking/fixing meals for my grand daughter—thanks to all the great products out now! We just went GF for my son last year. I found some really yummy chocolates at Aldi of all places that were GF and had no artificial flavors or dyes. They were adorable little chicks made of hollow chocolates, bunnies on a stick and some egg shapes. And some little egg cartons with gum in them. SO CUTE! Oh and a large solid chocolate bunny. We also made “Resurrection cookies” aka meringues in the oven and in the morning they are hollow ( empty tomb). Everyone loved them and they were SO RICH one was enough! I would love to tell you a cute idea I have for my G-free kids and family but the truth is that this is out first gluten free, dairy free Easter and I’m Compleetly at a loss. I’m searching everywhere for good ideas for my family of seven. Amie–i just made some great Gluten free, dairy free easter candy. I got a bag of safe chocolate chips (i used wegmans semisweet chocolate chips, i know enjoy life can be used too), melted them and put them into bunny, egg and heart shaped chocolate molds. I also did a small layer, put sunbutter in the middle (because we have nut allergies) and then another layer on top, so it’s like our version of ‘reese’ candy. Cherrybrooke kitchen has gluten/dairy/egg/nut free sugar cookies that are great. I made those and put pillsbury funfetti on top with sprinkles! This is also our first gf Easter, but this past year I have tried to just recreate everything u used to make but gf. My favorite Easter treats are these bunny cupcakes by bettycrocker. The decorations for them are all gf: marshmallows, sprinkles, mini chocolate chips and sugar. We’ll also do a gf dinner of ham, turkey, cheese potatoes, veggies and gf rolls. :). I’ve also had those cones before and they are delicious. Made some GF sugar cookies! 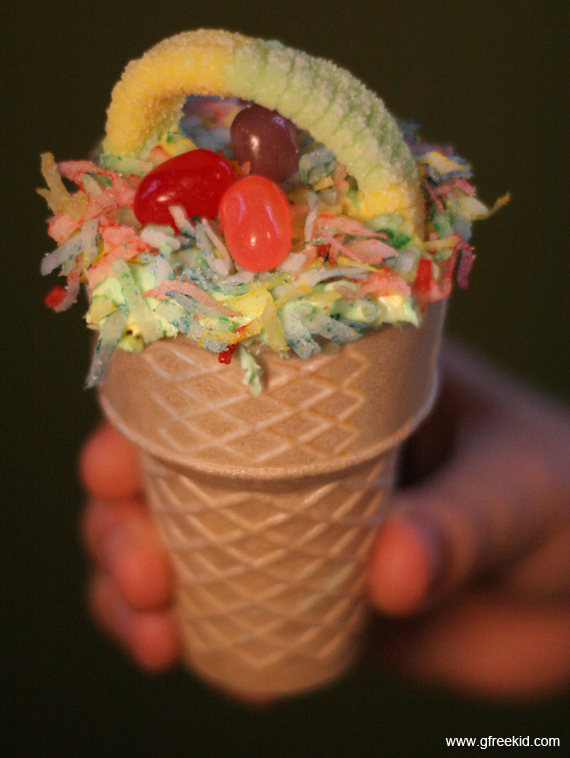 Looks like fun- my GF five year old will be thrilled to make these! Our Easter dinner is all gf. This year I have a dinner roll recipe that is gf that is good. Gf bread has been a challenge for the holidays. This will be our first gluten free Easter. I found that most of our favorite candies were OK but I am really, really missing the malted eggs this year!!! This is the first time I’ve even heard about the GF cones. I’m really excited about them! What a cute post! Our traditional Easter dinner of Cuban pork, black beans, and rice is naturally gluten-free, making it easy for everyone. Favorite gluten-free Easter basket goodies include Peeps and Starburst jelly beans! This is our first GF Easter. It isn’t the kids with Celiac it but me! I can’t even afford to bring stuff in the house that won’t accommodate my needs. Your ideas have really helped my family see that we can enjoy just as well now as before. Plus the kids are really loving the hands on making of the Easter treats!! Missing malted milk balls too! Thanks a million for sharing!! We usually end up bringing along our own desserts to family gatherings and let everyone eat the GF/DF foods. For the Easter basket we try to stay away from candy, but since he can’t have dairy or gluten we usually end up with jelly beans galore. 🙂 Books, stickers and puzzles tend to make up his basket. We also tend to bring our own food plus some to share. Funny enough, everyone always LOVES the stuff we bring- new twists on veggie sides or fruit salad. I tend to do toys in lieu of some of the candy and then do jelly beans and other “safe” candies in the Easter eggs. Rather limited selections at times, but sugar is sugar to him. Wow. Cute, and doable for my wild little guy who loves to help me “cook”. Everyone would like to eat one. I minimize the candy at Easter, and check gluten-free lists to make sure all the candy is gf, even for those who don’t have to. I’m more likely to put coins, hair ties, erasers, stickers in the plastic eggs for hunts, with a prize for either the most eggs found, or finding all their specially marked eggs fastest. The meal is easy to keep gf, if I make some of the better gf rolls. Sixlets and smartees for us! Plus…some coins and dollars, and treasure map that will lead to other goodies like new pjs and book! We take some of the sugar out of Easter, but still have fun! I like making little pastel colored moon pies and mini cupcakes. It’s easy to do too! All you do is take a gluten free yellow or white cake mix and put some food coloring in to the color you want. Then bake in mini muffin tins. Once they cool, cut the top off the muffins and use the tops to make the moon pies with either frosting, marshmallow creme, or a mixture of both in the middle. Once those are done take the extra frosting and frost the bottom sections of the mini cupcakes. They’re like cute little cupcake hors d’oeuvres! These baskets are adorable! For each holiday I research which candies are gluten-free to make sure that everything eaten is safe. I’m so glad Peeps chicks and bunnies are gluten-free! Love these baskets, my 7 yr would love to make these to share with cousins and/or friends. Last Easter we ‘donated’ the ham (and included the gf flour blend for the bag, too) for the family Easter dinner. I’ve recently discovered (by accident) that my homemake gf carrot cake cupcakes maintain their shape so much better in the jumbo tins. Can’t wait to make them again, they are super yummy and my picky (not gf) husband can’t keep his fingers away! Wow, this is my first time checking out your blog and I LOVE the Easter basket idea. I will definitely use it next year with my preschool classes (we are on our spring break now). I am the one with celiac in my house but I make all family gatherings gf to reduce the risk of cross contamination. We love the Costco Kirkland brand ham and I make an amazing merangue lemon curd dessert that is naturally gf. Thanks for the giveaway! We try to steer away from alot of the sweets in the Easter basket and put more small toys. I always have Easter dinner at my home to make sure it is things my son can eat. I just stumbled across this blog and will surely be “stalking” it more! You have so many creative ideas that i am excited to try! I am a college student who gets left out on with all the brownies and cookies my roommates are constantly making but now i can get them to make treats and things where i can enjoy too!! 🙂 thank you and PLEASE keep posting!!! We are going to try the chocolate dipped marshmallow treats you shared in a previous post this week. Have not seen GF ice cream cones locally. Would love to try them! We were very thrilled to discover Jelly Belly brand beans are GF! And Peeps too. Our daughter was very excited to sample her first bag of jelly beans this year. Maybe too excited, ha! My mom and kids are all celiac. Our family does a great job serving all, mostly naturally gluten free food. In some areas we have found suitable ingredient substitutes for family favorites. For my kids Easter baskets, I locate GF candies, then back my label reading up to the safe GF Easter candy list to be sure. I think we are going to make “bunny bait” that I saw an Pinterest to share with the cousins! Make a bunny cake with a gluten-free cake mix – bunny face, jelly beans eyes and ears, etc. Yummy!! This is our 2nd GF Easter. We still do an egg hunt but we don’t always do baskets. We don’t eat soy so that eliminates a lot of products. I’ve never seen these cones but it would be such a treat to get these! I know we’ll be eating ham, sweet potatoes and strawberry cheesecake. Rose, my 3 year old is gf intollerant and to make life easier I just made our home gluten free. Love to try the cones! My goodies arrived today. Thanks a million Goldbaums, too! Thanks for the great ideas and for choosing us. Looking forward to a good ice cream cone and the Wonder Meal looks good. Nice idea, as I keep a non perisable at school for the ‘just in case’ times that lunch is forgotten. Once again, thank you.